A 11- Initiative for Economic and Social rights has organised the conference “The Day after Human Rights day- where are we now?” within the project that is supported by the British Embassy. The conference was organized around three panels on the topics of intersectionality of human rights, role and impact of independent institutions in protecting human rights and measurement of human rights and the tools we can use for those purposes. Within first panel that discussed intersectionallity of human rights, head of the UN Human Rights unit Milan M. Marković stated that it is important to emphasise content dependency and connection of human rights, as well as that the application of the concept of intersectionallity of human rights leads towards greater efficiency in practicing all rights. He also states that separation of human rights to civil, political, economic and social rights is more artificial than substantial. 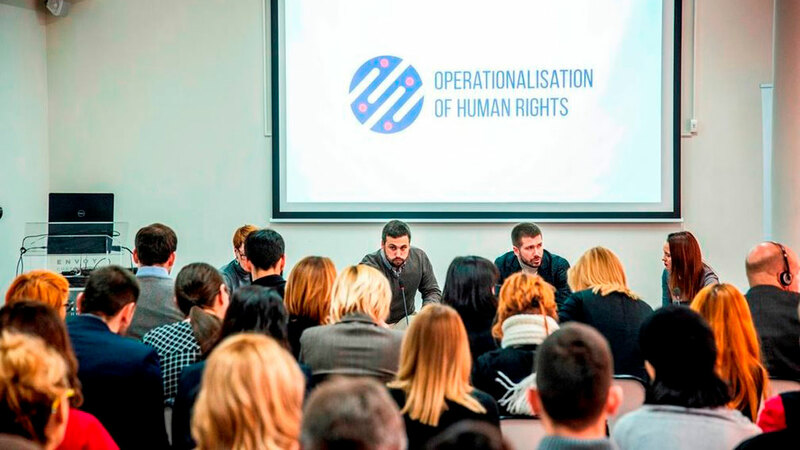 This opinion was confirmed by Nikola Kovačević from Belgrade Center for Human Rights who spoke of practical tools of operationalisation of human rights, who also presented examples from practice that he encountered while providing legal aid to persons deprived of liberty. Jelena Višnjić, cofounder and programme editor of BeFem touched on the influence of feminist movement and its effect on achieving social solidarity, as well as the responses of feminist movement to regressive politics and regulations on position of women. During the discussion, it was emphasised that during examination of importance of application of specific rights such examination should not be done because of ratified documents, but rather because of the essence of specific rights. Regarding the role of independent institutions in protecting human rights, it was emphasised that increasing hate speech is one of more significant challenges that Commissioner for the protection of Equality faces. In addition, Commissioner for the protection of Equality, Brankica Janković pointed out recommendations of Council of Europe and ECRI to increase authorities of independent institutions for human rights. She considers that independency of institutions is kept by greater guaranties for independent functioning of institutions and with increase in visibility. Nevena Ružić, Assistant to the Secretary General of the Commissioner for Information of Public Importance and Personal Data Protection pointed to the preassures the institution of the Commissioner for Information od Public Importance faces due to the expiration of the term of office and reelection of the next Commisioner, as well as misunderstanding of the role and importance of this institution by legislative and executive authorities. Andrea Čolak from European Roma Rights Centre emphasised that citizens are willing to address independent institutions to the extent of their knowledge of the workings of independent institutions and to the extent of their willingness to fight for their rights. In further discussion on this topic, prof. dr. Jelena Jerinić from Faculty of Law Union University stated that if institutions are independent that does not mean that they are non- governmental. State administration should enable citizen to practice their rights, while independent institutions should do just a fragment of that work. The conference concluded with presentation of the topic on measuring progress in practicing human rights. Biljana Janjić from FemPlatz pointed out that we still do not have data that is sorted by gender or other sensitive categories. She considers that if we do not have evidence and data, we are actually operating on presumptions on what we should do. Discussion included next steps, or how can measuring human rights affect promotion of public policies and regulations. Koldo Casla, Policy Director, Just Fair UK spoke about how measuring human rights can affect promotion of policies and regulations as well. The goal of the conference was to direct attention to key questions and innovative approaches to understanding and operationalisation of human rights in Serbia, as well to exchange experiences and new techniques and tools for their promotion. The participants were domestic and international experts in human rights, activists, as well as representatives of civil societies, independent institutions, state authorities and international organizations.